Part 1: What Did We Learn ? Central terminals are a key bottle-neck that restrict alternatives to the auto’s dominance of metropolitan transportation. The best investment to improve American commuter habits is to convert terminals into through-stations. The resulting through-networks will serve us well to accelerate alternatives. This served as premise of the five introductory articles posted in Autumn 2017. (See “Table of Contents” right column.) The fifth (Preview C) describes America’s most relevant progress; showing the improvements in stations in Philadelphia, Twin Cities and Denver. Success in these last two metros were preceded by reforming authority. The nation’s only recent and economically successful new line was possible because the Denver RTD also realigned public and private interests into a 3P service to its airport. Strategies: Reform Authority. Realign Interests. If these two strategies are to help shape the next regime for commuting, they must resolve the bottle-necks: those legacy terminals that fail to convert and prevent through-networks from starting. Each terminal has long-term plans to be converted. Yet, obstacles to progress persist. Almost all update efforts get reduced to the superficial. As the largest example, Penn Station is building an expensive concourse. While its drawings are pretty, the new Penn will not have the wider platforms to handle the flow of higher capacity through-tracks. Building them later will be far more costly. Losing to funding priorities, Penn’s through-route will be postponed; despite the metro needing increased train capacity now to help alleviate the City’s decade-long subway crisis. Such delays are what poor governance does to transit and it emanates from legacy terminals. While all five terminals need a through-route to grow their networks, agencies are not meeting that prerequisite. As comparative evidence of American metros’ failure to prepare trains as a vital mode for the future, I scatter examples throughout this site on how most major European cities have through-routed. During its five decade terminal conversion, ridership on Europe’s commuter trains has grown significantly. National rails were reformed and, in turn, have experimented realigning with the private sector; most advanced in England. Proof is in the pudding once terminals are converted. I use this U.S. map to show our horse-and-buggy, state and county-based regimen is a misfit to make transport efficient in today. A metro’s multiple counties — and often multiple states — respond poorly to the subtleties of moving people and goods. Most seek more efficient corridors. As such, reorganizing to improve corridors accelerates alternatives. The key to advancing trains is that states must delegate authority to a metro. Without an agreed-upon metropolitan government to delegate that authority, it goes to a transitional corridor body. It experiments with realigning public and private interests for an update which can include stations and operations. Proposing this change, the last five articles sketch how corridor-based authorities could help convert terminals, start through-networks and turn them over, eventually, to an enhanced metropolitan authority. Corridors have a key benefit; they align with Value Capture. VC is a funding strategy; but rarely gets the job done because laws and agencies are not suited to making VC deals. But if we realign properties that prosper from trains with new laws and agencies that deliver, we increase their tax justifiably. Also, corridors can offer a believable deal to convince the public that changing commuting will benefit them. With the revolution in personal mobility improving the “first and last mile” to transit, a corridor-based authority is more likely to increase ridership than current agencies whose ridership is in decline. Worse is their record on congestion costs in which this study indicates an increase of 50% to $186 billion by 2030. Since 60% is direct costs of fuel and money, investing in corridor mobility raises the value of transit-oriented properties further. To realign interests and create more competition, this corridor-based authority will shape the body of law and practice that makes it easier for the private sector to provide transport services. Of course to get private efficiencies, the corridor authority should not be bureaucratic and, instead, should sunset. It also should be an accountable advocate for a flexible transportation policy that delivers results. That’s the overview. Next is a summary of articles detailing these conclusions. Since many of you are new to this blog’s distribution list, I offer a quick overview of how this inquiry has evolved and matured. “WST” started describing how stations evolve in “The 4Ms: From Marvels to Mistakes to Makeovers to Masters.” The first 3Ms describe American terminals and the 4th M (Masters) are the rule in Europe; stations that center high capacity through-networks. Pictured above celebrating its 100th, Grand Central remains a Marvel. But, it will not become a Master until regional authority gets reorganized rationally. Dis-organization is analyzed further. I name its condition “a Pecking Dis-order” in the next chapter “What Is To Come.” I set a hypothesis for the series to test: American stations that improve do so because they started reforming how transit is governed. Our corollary; those that don’t improve as first planned, then must improve their governance that gummed-up the plans. “Preview B” is this blog’s “Readers Digest” version analyzing how American policies keep stations from evolving. It looks briefly at the federal role and introduces the “social contract” to help regions develop commuting options. Why It Pays To Through-route. Philly is the only U.S. metro to convert its terminals. This helped transform its Center City. The progress this through-route investment buys is captured in the two photos above. The top photo in the 1950s has the Reading Terminal in the far left side and Pennsy’s Suburban Terminal as Philly started discussing how to connect the two. The color photo is 40 years later, about 12 years after the Connection had been made. Its success continues paying dividends by speeding up the next major redevelopment… around the Connection’s third station at 30th Street. “Preview C” also discusses Denver, this decade’s most successful build-out. Most credit goes to its elected Regional Transit District. Their peak success is the airport-Union Station line; designed for the convenience of air travelers and exceeding ridership goals in its first two years. But unable to incentivize residents to commute, ridership lags in the RTD’s jurisdiction. Finally, we look at the Twin Cities. Its regional government experimented with different funding bodies that offer important lessons to other metros. The most recent lesson is its two urban counties kept their funding mechanism and are making quicker progress on their buildout; not burdened with the politics of suburban counties who pulled out of the funding body. The run-through tracks (right purple) at LA’s Union Station (brown foreground) cannot afford to raise all ten tracks four feet to pass over U.S. 101; required, apparently, to accommodate truck heights. Or at least, that is my summary-surmise since there is official silence on which agency can, or will, trump the powerful trucking industry. Because LA also struggles with declining train ridership, the chapter focuses on how California can devolve more authority. Specifically, how can the San Francisco – San Jose Corridor bring Caltrain to downtown SF as promised for their fancy new station. Corridor reorganization offers two advantages. First, limited southern access to the SF peninsula means both highways can be tolled. Second, Silicon Valley and the full Corridor is wedged between the Bay and the hills; creating great land values that can be exploited for Value Capture. No agency has the power to mine that VC. This chapter also shows how California’s evolution in devolving authority offers lessons to other multi-metro states such as Texas and Florida. The next two chapters analyze the common problem of tunneling under downtowns to create high-capacity networks. At my last count, 15 of Europe’s 17 major metros have converted most their terminals into through-stations…many using tunnels. Now largely complete, this capacity update has taken five decades. It was driven by reformed national authorities that, in turn, promote regional rail. Yet in this Century, American cities have only talked about the tunnels they know they must make. Here is our best chance to change that. Who should help? Worldwide, most capital districts have advanced transportation; usually structured by national authority. DC needs such a regime. This article looked to prototype federal power for Washington Union Station to serve as a proper through-station for a metropolitan system. If properly marshaled over a decade, this regional rail authority would reduce chronic peak stress on Metro. Yet without coherent authority, change is too slow. The impressive enthusiasm of the Station’s 2012 Plan faded. A superficial concourse update, the Plan’s Phase 1, was to be complete in 2017; it now looks like 2022. The Plan’s Phase 4 diagram (above) contains a circled “9,” the tunneled commuter through-run. Envisioned to start in the 2030s, its realistic start date is at least a decade later given the insufficient authority and funding. Since Metro’s recurring stress needs strategic help now, I sketched how a federal authority could start regional rail uniting the two fledgling suburban rail systems. This type of authority also could help Baltimore’s still-struggling downtown get a central through-station. Bringing the NEC and two MARC lines through downtown requires a multi-mile tunnel. Boston is more straight-forward. The overall effect of terminal conversion for the metro is best captured in the graphic. The left diagram shows how today’s limited train options terminate into uneasy transfers to Boston’s already over-burdened transit. On the right, we see how enriched commute options emerge by connecting the two termini with the North-South Rail Link proposal. Plans include adding a new CBD station. While the project seems to have lost momentum due to lack of state agency collaboration, their website still is a model for any metro needing to organize citizens around connecting their main stations. MassDot has lost legitimacy in connecting the two stations; having been the laggard a decade ago when the U.S. pushed this project. Having caused much more future expense, Mass DOT now should delegate authority to the region so it can borrow and generate revenue or tax. As part of the deal to rationalize governance, all needed state authority should be delegated to modernize the system into regional rail. Excellent proposals recently were made by Transit Matters. While a corridor-based transition strategy might help the politics of creating a true metro authority, I did not propose one for Boston as a different structure might be more useful to get this state to embrace the future and delegate as needed. Map courtesy of Hudson River Tunnels Project factsheet. It’s all bigger here. How far American trains have fallen, how ridiculous the Pecking Disorder has become and how far public and private interests have been misaligned and the consequences of this neglect are all most dramatically seen in the inability to add a new Hudson Tunnel to replace the one made 112 years ago without one public dollar. Severe authority dysfunction creates a potential threat several times more catastrophic than the collapsed PATH station after 9/11. And, today’s threat is self-imposed. With that as backdrop, this article proposes declaring a federal emergency that remakes the Hudson Tunnels properly; but also by preparing for a true regional rail that makes Penn a through-station for passengers to travel from NJ to Long Island. Since NJT trains are stored in Sunnyside Yard; a smart authority just adds passengers. Like the DC Corridor, the Hudson-to-Long Island federal authority should make decisions with state agencies, or independent of them if needed to get the job done on-time and under-budget. My article only outlined this seamless regional rail system tunneled under three bodies of water. But since it tunnels under America’s most valuable real estate, the potential is high for Value Capture and corridor-based financing. Because the Hudson Tunnels situation is getting dire, this Corridor probably will be the first detailed proposal of 2019.
photo above, courtesy of River Edge Ideas Lab. Through-Corridor for America’s rail center. The next article analyzed Chicagoland. It proposed making an at-grade through-run from O’Hare Airport, connect the two main terminals and then take passengers to the convention center. That corridor-based proposal can serve as prototype for a more comprehensive solution by creating another main station between the old PO and the southern end of the currently-owned Amtrak yard which is ripe for redevelopment and Value Capture. The Second City’s main rail corridor (three miles long above) could maintain its status as America’s second busiest once it through-routes. Each metro’s dysfunctional authority for transportation (what I called today’s “Pecking Disorder”) and their inefficiencies (misaligned interests) can be corrected by a new social contract. Many of this website’s proposed remedies are corridor-based and can inspire a new public confidence that will entrust new tax money… enough to evolve high-efficiency networks. This simplification can overcome mis-alignments caused by transit’s monopoly and the car’s oligopoly… if there is a transfer of power from the state to the metro. These last five chapters increasingly found existing laws that can be pushed or brushed up. This started when I noticed how California is delegating more to its metros; so my “Caltrain Corridor” proposal seemed within bounds. In my state, Illinois just allowed Chicago to create transit corridor TIFs, including one for Union Station; so there is precedent for the corridor proposal and it just needs logical extension. A different set of laws will extend federal authority to rebuild Manhattan’s Tunnels as a through-network and integrate suburban DC systems. This requires a new politics which, hopefully, the new Congress seems to be birthing. While corridor alignments of authority and taxes are a way through the impasse, corridor officials require new forms of accountability if they are to succeed in their tasks; which include evolving to metropolitan based agencies. In concluding, it is worth the reminder of how other nations — our economic competitors — progressed by investing in through-routes. Certainly, the biggest mobility advantages belong to Japan and South Korea. But since American culture, its social contracts and laws are so different, the analogy is not helpful and is rarely used in this series. Most comparisons were drawn from how Europe invested to convert its terminals into through-networks. As motivation to adapt these lessons to U.S. politics and circumstances, let’s remind ourselves of their benefits. While proving the technical feasibility and economic value of through-routing, European analogies will break down when thrown into the cauldron of U.S. politics. Primarily, Europeans have strong national rails. Also, standards set by European Union Directives must be followed which include decentralizing national rail into subsidiaries. Overall, European policies are integrated and also promote regional rail. Recently, some policies even encourage competition. Authorities rebalanced. Interests realigned for the future. Preview of Part 2: Commonwealth Progress and Better Lessons for U.S.
A few British Commonwealth nations have a mid-20th Century Deal similar to the American Dream of owning a suburban home with cars as the dominant mobility mode. Yet recent successes in Australia’s three major cities and Toronto gives the U.S. clues to advance trains as an alternative. Toronto is equal in population and geography to Chicago. Both Union Stations in the 1980s had a bleak future. Toronto’s remake as an urban destination and hub for a RER-like (Paris) high-frequency service makes it the only North American station triumph since the 1983 completion of Philly’s Center City Connection. Part 2 looks at how Toronto’s Metrolinx agency functions with state (provincial) authority. While its ridership grew 11% in the last four years, Toronto’s trains passed Chicagoland’s per capita. As Toronto’s RER-like service begins attracting riders even faster, ridership in the Second City stagnates further. Part 2 also briefly explores Aussie and Canadian attitudes and policies that encourage mobility alternatives. This article from “CityLabs” on Canada is about public services, but is good backgrounder for both countries. From my travels and study, I’ve formulated a “Commonwealth Deal-Maker” that suggests how the U.S. may get a few clues for its transformation. I summarize three key factors. 1) States/provinces actually serve the city and metro. While most U.S. states have contentious relations with urban areas, provinces/states have only one large city and its politics invests in its urban money-maker. Practical. 3) Good Government speeds up a new social contract for transportation. Derived from Canada’s principles of “Peace, Order and Good Government,” Australia shares the same motto and founding notion that taxpayers pay to get a service. Isn’t that what a social contract is supposed to do ? Part 3: So how do we get success in the land of “Life, Liberty and the Pursuit of Happiness”? Drawing on U.S. history to know what worked when major infrastructure last got built, consider the debate over Uncle Sam’s control over the gas tax during the 1930s. In the “position“ represented in the cartoon below, Uncle Sam was siphoning off too much gas tax, some 21% by the numbers offered. Yet, it worked out. The eventual Interstate Highway System was the marvel of the century. To shape the new century’s commuting alternative, Uncle Sam’s role still is key. In fact, I have little hope today’s legacy systems can be brought into the 21st Century unless federal laws empower regions to improve their learning curve and reduce their cost curve and, of course, the U.S. provides financing support. Replace “gas tax” with “Uncle Sam facilitating Value Capture schemes” and we could have one of transportation’s essential 21st Century cash cows. Much depends on how we rearrange authority so interests work together again. While federal policy may lack nuance to solve specific region’s problems, the U.S. can and should do more to structure an alternative regime that rebalances authority so metros can realign interests to create more reliable alternatives to the car. And let’s not forget that legislative sensation starting the 116th Congress, the New Green Deal. It needs some policy meat on its bones. Know that legacy systems serve 25 of the 43 Districts flipped in 2018 by the Democrats. So, let’s add it all up. What is the deal so American metros can use legacy systems to get more commuters off the roads and get people to 21st Century sub-centers ? Answer that and we start making America’s Pecking Dis-order past tense. Author whatstationsteach.orgPosted on February 25, 2019 February 25, 2019 Categories Boston, Chicagoland, DC Metro, Denver RTD, federal transit policy, LA metro, New York metro, Philadelphia region, San Francisco, Twin CitiesLeave a comment on Part 1: What Did We Learn ? I venerate stations as our greatest civic building. Yet, I avoid CUS. Studying it over my life, I now tell its story as the weak link in America’s evolving urban mobility. Despite being the nation’s third largest station, CUS’ once-glorious concourse was wrecked in the 1960s and now survives in a congested basement; squashed by an office tower. I still get lost trying to follow the logic of this confusing concourse; and, I’m not alone. Major public dollars failed to fix this mistake. Today, Chicagoans face a repeat. So, I propose a way out. As with most American stations, CUS changes slowly… especially since one always wants better for the hometown. More important evidence is the clock’s 1991 date; marking the last renovation. Cost over-runs caused it to lose focus. We merely got an expensive facelift that tried to coverup a congested concourse. Above it, a constricted fast-food court causes passengers to pass through quickly and avoid the nostril-coating smell of frying fat; trapped by low ceilings and poor ventilation. Indoor air quality worsens as the train’s noxious diesel fumes get sucked, amazingly in reverse, from the platforms into the concourse by the powerful fans installed. With the 1991 money exhausted on these mistakes, agencies could not address core problems that bedevil CUS today; platforms and train sheds are dingy and decrepit… while the inefficiencies of a terminal suppress ridership. Metra’s last sustained ridership growth relative to regional population ended in the late 1990s. It stressed CUS; revealing bad design. In a 2003 response, planners suggested ways to break this maze-like footprint. Their corrections could be built into the space above using air rights of the south concourse and, below, into tunnels. But lacking money and authority, those plans realistically have been shelved. After 18 years of planning, little leads to this strategic option: a modern station suited to center the higher-capacity through-networks of our European competition. Today’s renovation plan (released in 2012) keeps the same early 20th Century terminal; unable to break government’s grip holding rails in an era long passed. In this article, I propose we start by briefly reviewing the Big Picture… so we can un-do why trains still terminate. Two key benefits of effective metropolitan transportation policy are: stimulating new property tax revenue; and, efficient commuting. In an insolvent state such as Illinois, these goals are not achievable. Proving this is the two decade struggle to update CUS and provide suitable train service to the airport. These two jobs fell, by default, to Chicago’s last two Mayors who made them priorities. Historians could well recognize the first Mayor as America’s best Big City mayor of his generation. The second Mayor probably will be his generation’s most effective operative; having steered the country from depression in 2009, among many feats. Despite superior leadership, the City failed to execute plans for CUS and O’Hare train service because Chicago, primarily, lacks authority kept by Illinois. Solving this requires rearranging authority into a corridor prototype proposed here that achieves these four goals that most advocates accept… at least in their hearts and minds. * Invest new taxes from the property owners who benefit most. * Invent economic delivery methods using the private sector. * Rebalance usage fees so commuters make economic decisions. * Hold this new authority accountable. The chronic lack of funding for CUS’ official Plan is a metaphor for the authority adjustments needed to deliver results. For example, indefinite delays in the task of converting unused luggage and mail platforms make it highly unlikely CUS will through-route before the 2030s (the 2012 Plan’s timeline.) Without a through-network, the CBD and other regional job centers will redevelop slower. In like vein, airport train service through CUS is the central piece of regional infrastructure that must be updated to the standard of global cities if Chicago is to compete in that game. To achieve that, this article outlines a Plan B that tests a funding strategy for CUS. A detailed proposal will post in 2019. The intent is that by 2025, this Plan B can achieve CUS’ first through-route: the corridor from O’Hare Airport to CUS to the Convention Center at McCormick Place. For brevity, let’s label the corridor O/CUS/MP. Since this corridor is the most economically viable, it also serves as a prototype to convert others among the region’s twelve lines and, eventually, shape through-networks. To capture property value and deliver improved transportation, Plan B proposes a Corridor Corporation. This CC uses state authority in exchange for Illinois not contributing its customary match. Key to this deal is property-owners near stations must fill the capital gap since they most benefit from the through-route. This CC is the next step in 2016 legislation that enabled Transit Corridor TIFs in Chicago. A CC reweaves these and other threads realigning authority with delivery methods that exceed what today’s agencies can do. A CC can solidify tax and legal experts’ proposals to expand powers of Special Service Areas (Business Improvement Districts in most states) and Special Assessment Areas. These are particularly useful tools to involve suburbs in metropolitan projects. These changes also will be explored when detailing the CC’s proposal in 2019. To fulfill its ambition, Plan B will have to overcome three Obstacles. Each is listed briefly; followed by a Solution that suggests rearranging authority. Each Obstacle/Solution will be detailed in a separate posting during 2019. As final introduction to today’s post, it makes four points as Background to support my assertions and stimulate your feedback. Then, the post finishes by sketching the two concluding articles of this series on the importance of federal participation in rearranging regional authority. Obstacle #1: Authority is misplaced. The world’s 5th busiest passenger airport has the above Metra station as its sole commuter rail service. One of six that terminate at CUS, the O’Hare line gets a mere dozen weekday trains in each direction. Reflecting poor collaboration, Metra and CUS did not figure in the proposal selected to fulfill Mayor Emanuel’s 2011 election promise of an O’Hare/CBD service. Despite having unusual power of controlling the airports, Chicago’s Mayor cannot improve Chicagoland trains or their stations. Upgrading Metra’s O’Hare Transfer was not politically feasible despite eight years of hypotheticals about connecting trains and planes. Nor does Metra have a major impact on the CUS update, despite Metra having 90% of passengers passing through. Preoccupied with its terrible fiscal problems, Illinois neglects the metro’s transportation. And having lost some legitimacy due to its imminent insolvency, Illinois instead needs to put the authority required for effective policy into a metropolitan body. Getting there starts at the Corridor and, specifically, the airport’s corridor to CUS and beyond. Solution #1: Plan B tests re-aligning Illinois taxing authority with the properties that benefit from the through-route. The rendering above of O’Hare’s six-story car rental facility is being built by the City of Chicago a mere 100 yards south of Metra’s sad O’Hare Transfer. Contrary to this common sense rendering, there will be no new train station for the facility. Recognizing this flaw, the Midwest High Speed Rail Association made this station its first step in its O’Hare Direct initiative; emphasizing its leverage for regional economic growth. The MWHSR originally commissioned this rendering for its Chicago Crossrail proposal that connects Chicago’s two largest job centers (O’Hare and the Loop) with the convention center. While having a progressive vision, the proposal lacks a political strategy. Due next year, this website will detail its O/CUS/MP proposal for a Corridor Corporation, a hybrid public body to improve train service, generate adequate passenger revenue, capture the value created by the service and show the region what through-routes can do. Obstacle #2: Illinois cannot tax enough to redevelop metropolitan transportation. Let’s think of legitimate authority as having two Ts: Taxing and Techniques to deliver on promises. With voters suspicious that all new taxes will go to pay past bills or unnecessary cost over-runs, current agencies cannot justify a tax to close capital gaps. Lacking sufficient authority, mayors hope for Value Capture. But, bond markets price VC revenue streams as inconsistent; further raising finance costs. Lacking either “T” in the deal with the public, advocates first need to redevelop a governing legitimacy using new public corporations; hence the proposal for a Corridor Corporation (CC). While a Corridor-like TIF was approved by Illinois for CUS, it needs redesign so the bond market will respect transit in today’s terrible fiscal climate. A CC has a better chance to establish the needed credibility. As part of the deal, property-owners will agree to be taxed sufficiently. “Under new management” so to speak, bond markets will reduce their charge for risk. Also, a CC creates more flexibility to develop PPP variants and manage them to get the job done for all parties. Solution #2: Plan B makes a deal with Illinois so this prototype CC has taxing authority over the land it improves, advocates for overall transportation policy, elects its Board in clean elections and, finally, sunsets. To perform to promise, the CC for O/CUS/MP needs a New Deal that also holds Directors accountable. Clean elections are one proposal to be developed. Once this CC works, other line updates and through-runs are possible. To protect the public’s investment, the CC also needs advocacy powers to realign the economics of commuting. The strategy behind this proposed regimen follows the founding principle of no taxation without representation. Obstacle #3: Amtrak owns CUS, yet has only 10% of station passengers. Amtrak’s renovated concourse will connect to its same tracks that now run along the river and through, much as it does in the above map (still used at the station.) These also are the least expensive tracks for a commuting through-run. Economics says the higher revenue generators (work commuters) should use that existing through-run for O/CUS/MP. Economics also says Amtrak’s concourse (specifically, parts of the three Boarding Lounges in this dated diagram) could be redeveloped for a second, shared through-run by moving Amtrak passengers to other parts of the complex. However, these economic options are not driving the current plan. So instead of getting a through-track for O/CUS/MP, taxpayers will spend billions tunneling two decades from now when everything costs more. In successful countries, the national rail directly helps grow regional rail. Solution #3: Amtrak and Metra sell/lease assets so the CC makes O/CUS/MP. Shifts in authority are likely to cause political and legal confusions by Amtrak and/or Metra. Hence, we also need a new federal role. The U.S. must facilitate station updates that take steps to regional rail. Federal performance measures should include through-corridors and encourage Illinois to decentralize authority; making it smoother to establish regional governance. While waiting for a helpful U.S. Executive, much can be done to propose corridor authorities. For both the Big Picture and some details for O/CUS/MP as the heart of Crossrail Chicago, please also reference the Union Station proposal and the O’Hare Direct initiative of the Midwest High Speed Rail Association. The Case for Corridor Collaboration: These Four points make Plan B necessary and can boost each Obstacle’s Solution. While each Solution will be detailed in the 2019 proposal, I’m hoping there is a quasi-consensus to move beyond existing agencies. To get anywhere, that “consensus” requires a case. I consider it made on these four underpinning points whose logic I summarize as one continuous (un-grammatical) sentence. D) a new deal between levels of government inspired by the intent to give commuters real options. Or if you prefer, try this summary sentence….. A CUS through-route made with the intention of a through-network is the best cure for commuter rail’s chronic ailments. Point A: CUS has chronic congestion. These two photos of the morning crush are borrowed from the 2012 Master Plan to make this point: there is room in CUS to make a better station, just no money or authority. The unusable luggage platform in the foreground should be rebuilt to carry overflow passengers on both sides of each track and usher them up escalators to new exits provided by a new street level concourse. This makes it possible for more of the just-alighted passenger flow to divert from their next AM challenge, also pictured above: the existing escalator congestion from the mezzanine up to the sidewalk that passengers must squeeze through to get across the River. While a passenger diversion to new street level concourse was proposed by the selected developer, it has been deferred. But even if this street level concourse gets back into the next plan, how long will relief last from this latest renovation? CUS’ combined platform, concourse and exit congestion are problems of integrating passenger flow; backup in one area causes backup elsewhere. Constricted by the office tower above, CUS will be expensive to fix and, most likely, will not yield desired efficiencies. Good proof is the passenger flow improvements promised in the 1991 renovation; a re-engineering attempted by a star-chitect. By 1999, the rush hour crush looked too much like the above photos. Why does congestion recur unsolved? Consider CUS’ collapsed concourse as a damaged lung; capacity never comes back well. Whenever stressed (as it is 4 hours a day), the patient will have trouble breathing. The best way to manage this stress is to divert traffic and start the first through-route now… or at least that case is made in my 2019 article. To address this chronic condition, there was promise. Amtrak owns air rights in my photo that looks over the south train shed. The selected developer was to rebuild these platforms and replace the shed roof with a street level commuter concourse. All paid for by the new high-rise above. This creates an option for over one-third of passengers to avoid CUS’ constricted maze. However, public difficulties (delay costs and preservationists) caused this option to drop from the developer’s deal. The most effective building to release stress and allow passenger growth has been shelved. To change this pattern of difficult public-private partnerships, consider how a CC with proper authority can help the developer build a concourse that allows ridership to grow again. Recent planning is driven by Chicago’s DOT. To their credit, they did a good job delivering the 2012 Plan’s promise for redesigning CUS’ surrounding streets and building a bus terminal for a dedicated busway (the Loop Link) that connects CUS passengers to other terminals and key destinations. But, CDOT’s ability to deliver gets compromised once regional infrastructure like CUS needs an overhaul. Frankly, CDOT’s initiative is a default to the least powerful agency since Metra and Amtrak showed too little incentive. To be more blunt, it is not the Mayor’s job to cure CUS’ chronic condition. In fact when cities take control of their stations, they regret the cost and headaches. Ask Toronto about their two decade struggle with Union Station whose tracks are owned by other agencies. My 2019 article will explore how a CC for O/CUS/MP actually can make deals more believable to the private sector and through-route Chicago’s two largest termini. These and other ideas to generate higher property values are suggested in Point D: Make No Little Plans. The exercise is worth it. Fixing the CUS choke-point is — dollar-for-dollar — our best investment in reducing road congestion. If all this seems far-fetched to expect from a moribund Metra, maybe we should take some inspiration from what Paris achieved… way back when Jimmy Carter was President and our rails went on life support from the states. Point B: Only through-routes significantly grow train commuting. The benefits of through-routing can be best understood comparatively. Chicagoland and the Paris region have similar sized populations. As the 1970s ended and absent a federal policy, bankruptcies had reduced Chicago’s eight terminals to four and Illinois has neglected this asset since. Consistent with America’s multi-decade failure to find a cure for road congestion, Chicagoland’s Metra ridership has been practically flat since 1999; when adjusting for the region’s 14% growth. Conversely resulting from France’s national policy, the RER regional rail today serves as the western world’s standard. By 1978, Paris converted four terminals into through-stations; connecting them mostly via center city tunnels. By the end of that century, the RER through-network’s ridership almost doubled. (See the fourth graph supplied by “Transport Politic.”) And while the Paris region’s population grew only 11% in the 21st Century, RER daily ridership has grown 65%… or almost six times faster. Most global cities of western Europe have a half century head start on the U.S. in developing regional rail; assuming we learn to govern regional rail soon. But, Chicagoland’s missed opportunity is actually worse because it had the world’s most robust collection of rail lines in the first half of the 20th Century. Not investing in this asset to solve our transportation and redevelopment challenges is a failure of the outdated agencies we keep. Now is the time to test alternatives that yield solutions for commuters and taxpayers alike. Converting CUS into a through-station is a modest investment to keep Chicago in the global city game. The 2019 proposal will argue the CUS conversion will be regional government’s key contribution to fiscal and economic sustainability. Point C: Fixing authority is in Illinois’ best interests; so is a new deal. The above photo is from a traffic helicopter over an expressway that runs next to two Metra lines. Inefficiently used, this wide corridor captures the cause and cure of Chicagoland’s congestion. Single occupant car commuting has persisted at 70% for two decades; unaffected by policy talk and inaction. Furthermore, trains are not a viable alternative when Metra’s unmet capital needs double each year from 2018 to 2020; calling into question its viability as an agency to reduce congestion. Furthermore for city and suburbs alike, today’s revolution in micro-mobility for the first and last mile will be a missed opportunity to reduce congestion if we don’t make through-stations that increase capacity. Investing in them leads to RER-like through-networks that become high-capacity when integrated with other modes. This is the basis for regional rail that U.S. cities lack in the global competition for capital and talent. There is a credible chance to get regional rail if we experiment with metropolitan transportation authority; such as the proposed CC for O/CUS/MP. This CC also lets Illinois off-the-hook for the matching grant responsibilities it now shirks. Best yet, starting to test corridor authority costs Illinois nothing compared to its 20% capital obligation. A fatal flaw governments are not resolving is how future obligations delay investing today. Restricting regional progress, states tend to grip too tightly their taxing authority. In Illinois, this led to three decades of dependence on Tax Increment Financing (TIFs); emerging now as speculative financing. Before a major recession makes insolvencies inescapable, TIF-like financing must be reformed. Corridor-based financing must be tried as an anti-dote. Specifically, Chicago has yet to convince the bond market that TIF dependency can create stable revenue streams, particularly for transit. Without really trying to solve this weakness, Illinois legislated in 2016 four TIF corridors to update Chicago’s transit. One is for Union Station. Changing the CUS TIF to be directed by a CC will help the update produce a revenue stream that satisfies the bond markets better. While key pieces of the funding puzzle threaten the CUS update, its immediate threat is its champion (Mayor Emanuel) will not run for a third term. But, he did propose this strategy at the event launching Chicagoland’s 2050 Plan: if Illinois does not pass a capital bill, then the metropolitan region should take matters in its own hands. To prototype that process using property values, the CC for the O/CUS/MP through-route is proposed. 2019 presents a unique opportunity to break this pattern by rearranging authority amongst our fragmented levels of government. Next year, there will be a new Mayor, a new Governor and a new Congress. But those leadership changes will not result in the changes CUS needs, unless those three obstacles sketched above are addressed. I will detail that in my mid-2019 proposal. Point D: “Make no little plans.” Burnham’s clarion call again applies to CUS, the terminal his firm designed before World War One. It also applies to Chicagoland’s central corridor in the above photo. Since trains started declining in 1950, Chicagoland population nearly doubled. Today’s chronic congestion remains a regional drag, currently without executable cures. Europe’s global metros prove regional rail is a cure. But, Americans cannot expect to reduce congestion appreciably until terminals like CUS are converted to through-stations and they, in turn, center higher-capacity networks. Faced with repeated failures to convert terminals in five major metros, the U.S. needs a strategy with a reasonable probability of success. Consider CUS a prototype. Courtesy of The River Edge Ideas Lab, this photo summarizes this City-prompted project that invited six architect-planners to reimagine key crossings in this rail corridor along the south branch. Today’s strategic transit point is the left-most circle. Below it runs Amtrak’s through-track along the River that exchanges passengers at CUS two blocks away. (This through-track is shown clearly in this article’s third graphic, the aging diagram of CUS tracks and concourse.) Also near this left-most circle is the east pedestrian entrance of the OTC (below), probably the only point that can connect the two terminals anytime soon. If some body — like the proposed CC — had authority to lengthen CUS platforms two blocks to the north, passengers also could alight or embark from OTC. If Metra were to use that track, CUS and OTC could start to act as through-stations. In my photo above, I stand next to OTC’s east door. In this plaza, two elegant canopies could cover escalators down to the proposed through-platforms. Chicago’s two main terminals would connect and a through-network could start… cheaply. ‘De facto’, Amtrak blocks the rail transformation that could be started by two inexpensive through-stations. Connecting the two stations is an efficient way to relieve peak hour stress in CUS; given that a concourse over the south shed is improbable. And even if it is built, CUS still is a terminal that limits progress. Finally, any successful partnership with a developer must make them comfortable with their risks in delays caused by inefficient bureaucracies. Consider that a concourse/tower can take a decade to plan and build; when factoring in that we are now at the top of the real estate cycle. Ghosts of risk are posed by three recent failures. First, CUS is in similar situation to 2007 when developers and financing were lined up. Second, no one forgets how the O’Hare Express station contributed to the famous Block 37 developer bankruptcy because authorities were too disorganized to act in a timely manner. The third example illustrates how poor aligned authority creates risk to taxpayers. Consider the missed opportunity of the old Post Office; now being converted into offices and a food court. As a destination, it has twelve tracks passing under it with potentially two more along the river. This food court now sits on the most economical site to build a concourse and reduce CUS congestion. Instead of the food court, the new CUS south concourse could remove half of CUS’ current stress. This would make it easy to convert part of CUS’ old concourse into through-tracks. Plus, the Blue Line stops near the old PO; partially solving CUS’ poor connection to heavy rail. Redeveloping the PO properly would so vastly improve efficiencies that it could, then, trigger through-runs. Many reasons made the PO into a missed opportunity. But, the key reason is that no public body had the bonding and authority to take charge. Any serious discussion of having the authority to fix CUS needs an end-around Amtrak. While Amtrak’s recent regional leaders found modest money for station updates, leadership is changing… as is ownership of Amtrak’s extensive railyards below. The realigned authority of the proposed CC for O/CUS/MP also serves as prototype for redeveloping this train yard. (Its photo above also is courtesy of River Edge Ideas.) Finishing the eastern end of Chicago’s central corridor is the circle above. It shows the rail bridge that would carry the O/CUS/MP trains to the convention halls. Bottom line: converting this Amtrak-owned railyard is an opportunity to make a downtown that models more sustainable transportation. Vision aside, the practical challenge is for through-networks to produce enough revenue from property values to pay for a 21st Century system. Early stages of yard redevelopment is afoot with Amtrak spinning off the corporate entity that owns the yard and the tracks and the still-developable air rights above the south concourse. In addition to answering many of the realignment questions, the 2019 proposal also suggests a suitable partner for this public asset. For that, our CC concept must get a new deal with Illinois; alluded to in Point #3. 2019 is a good year to start. Until this proposal is made, I refer you for background to Alan Mammoser’s informative article on Union Station’s history and short-term plans. Or you can refer to my original CUS article in “The Urbanophile” series five years ago. I regret it is still telling today about why we are not serving commuters and taxpayers. Conclusion: Redeveloping CUS really is a chance for the region to start striking a New Deal for transportation with Illinois, commuters and taxpayers. CUS cannot be fixed properly by mis-aligned authorities. Worse, this will continue to raise costs and lengthen timelines. Supporting these assertions are the three obstacles outlined earlier in the article. Let’s overcome each with their respective solutions summarized below and to be detailed in the 2019 proposal. #1: Realign authority based on the transit corridor so it makes the O/CUS/MP. This efficiently connects three key job centers with one through-route. #2: Redevelop a deal with the corridor’s taxpayers and Illinois in which this Corridor Corporation (CC) supplements revenue by better capturing increased property values. #3: Give this CC the flexibility to partner with the private sector and the advocacy rights to reshape transportation policy. Rearranging the needed Illinois authorities into Chicagoland authorities will cost too much time… unless Uncle Sam helps. Similar to other states responsible for legacy systems, Illinois has talked about regional authority since it took over the bankrupt commuter services in the 1970s. But at best, the state has shown no commitment. Potentially worsening the situation, U.S. help seems unlikely… unless the federal retreat from funding transit is made orderly. Uncle Sam’s retreat must be preceded by regional powers to fill the federal funding gap. In truth, this is the only way to invest federal funds to do more with less. Otherwise, the federal retreat is doing less with less… and at the wrong time. Replacing part of Uncle Sam’s 80% with a rebalanced regional authority is a theme that recurs in this website. Only federal policies will help the Chicago, Boston, LA and San Francisco metros make their long-planned through-runs. Multi-state metros particularly need a US-prompted rearranging of authority to solve the transportation problems between New Jersey and New York… and between Maryland and Virginia. By clarifying similar problems, the federal role in each region’s solutions can be proposed convincingly. Despite differences on how each metro relates to their states, metro similarities provide a working consensus for a federal policy to promote regional rail. The obvious example, New York’s metro (three wealthy states) and Chicagoland (one insolvent state) have the common problem of forcing commuters into basement stations that current regimes cannot fix properly. Both Penn Station and CUS won’t work well unless these terminals are converted and center through-networks. Separated by only one street width, CUS and OTC could be easily through-routed. Similarly simple, Manhattan’s Penn and Grand Central could be through-routed via a mile-long tunnel; reducing stress on stressed-out subways. Creating two through-routes combines the four largest systems and totals 1.3 million daily commutes that could be improved. Plus, each system’s stagnant ridership numbers could start to grow. A simple win. Let’s prototype it. Using federal levers to evolve regional rail also supports a recent political strategy. Bringing city and suburbs closer around transportation corridors supports the strategy used in the 2018 election that flipped suburban Congressional districts. As Democratic strategists reshape their party into a Metropolitan Party, they must deliver urban policies to get re-elected. (I reference as seminal Bruce Katz’ 2017 op-ed in “City Labs.”) Federal investment guidelines that promote alternatives to single occupancy cars will help that political strategy cement a social contract. In that context and starting in 2019, federal pressure to make trains a competitive alternative could emerge as the trigger to deliver metropolitan transportation policies. In my forthcoming two-part article, Part 1 summarizes the similarities that legacy systems have. (That’s easy.) Part 2 outlines the federal policy. (That, of course, is the hard part !) Stay tuned and keep talking to each other. Preview F: Penn Station And The Hudson Tunnels….. Are We Ready To Start Testing The 21st Century Standard For Regional Rail ? The white dotted line is the first train tunnels under the Hudson River. They took just two years to plan. Construction started earnestly in 1905 using primitive methods. They were innovated and the world’s longest underwater tunnels were made by a determined Pennsylvania Railroad by 1910. They whisked thrilled customers on new electric trains into the world’s grandest station. They set the standard for the key transport mode for the first half of the 20th Century. It cemented New York as America’s premier Transit Metropolis. Today, that epoch-making success has deteriorated, along with the tunnels, into a telling metaphor for our failures to govern transportation. If we are serious about replacing the tunnels, we have to replace the agencies that created today’s crisis. This preview sketches how preventing an emergency in America’s key train tunnel may well be the crisis we need to start transforming how every American metro manages its mobility in the new era. If New York only builds a new tunnel and its connecting infrastructure (now known as the Gateway), the symptoms of system deterioration will repeat themselves somewhere else. The Port Authority has two other sets of tunnels over 100 years old. Similarly aged are two sets on the East River. Manhattan is surrounded by connections reaching the end of their lives. Let’s see why so many replacements have been put off for so long; endangering so much. In 1995, warnings that the Hudson Tunnels’ were reaching the end of life prompted plans for replacements. Fifteen years later the ARC project (Access to the Region’s Core) started construction and quickly was killed by New Jersey’s Governor under the pretext of not sharing cost overruns. With borderline belligerence between neighboring states, federal intervention led by Obama’s Secretary of Transportation mediated a deal by 2015 that advanced the Gateway project (Above, the sagging orange dotted line are the replacement tunnels; but the Gateway includes 11 miles of rail infrastructure from Newark to Queens, centered by the Moynihan extension of Penn Station.) The recurring political dysfunction took a destructive turn when the current Executive reneged on the 2015 deal. This voided the Tunnels’ hoped-for 2026 completion. Despite heightened anxiety over no body being likely to restore this vital artery, Congress’ response has been to try sneaking money into the Gateway to avoid the President’s veto. This Bloomberg article highlights the grave economic consequences for the region and nation in what is appearing to emerge as a path to catastrophic self-inflicted wounds. The graphic below shows congestion’s negative multiplier of the most likely scenario of one tunnel failing. Remember, all this drama is for an aged tunnel that would have been replaced long ago if it carried autos. A way out might emerge from my working cut-to-the-chase analysis: multi-state mis-governance caused this threat to the nation’s economic heart. If we learn from democracies with train policies, their regions modernize mobility far faster because the national rail has proper authority to aid commuter rail. With new U.S. policies using the force of federal law, neither Governors nor Presidents can capriciously void them repeatedly as with these Tunnels. Formed in the 1970s as a caretaker, Amtrak is weak and never reformed. This allows executive caprice to rule. Worse, it creates a void where progress is more difficult and costly than other global cities face since they have national policies that convey proper authority to national rails. And they have even reformed recently to improve efficiencies. Our reality is that today’s increasing dysfunction is unlikely to be resolved before one tunnel fails and causes an emergency. The cure is for a national rail policy in which metro rail is promoted by the inter-city rail authority. At this moment, that seems like a ridiculous long haul. But……. As recent as 18 months ago, it was just assumed the tunnels would be built by existing agencies. This is not a responsible assumption today. This became evident; prompted by two trends. Fortunately, both now make agency overhaul possible. First, divisive politics have forced metros to reorder authority… if congestion and costs are to be reduced. The current Executive’s sabotage of a deal that took five precious years to negotiate should be seen for what it really did: preserve a regime in which state and federal policies restrict metros from using trains to stimulate growth and mobility alternatives. Note that the Gateway project already was a major retreat from the historic federal contribution of 75% capital. The Obama deal had only 50% federal capital. Trump merely wanted to reduce it further. Transcend Trump and we see Uncle Sam will not recapitalize transit to the required levels. More than ever, metros are on their own and must devise new methods. Into that void must move the next Congress and the next Executive to start writing a new social contract with taxpayers and commuters in which metropolitan transportation is controlled democratically by the region… with the states and feds as lesser players and payers. I sketch this “new deal” later in this preview and, of course, will detail it in the chapter due in 2019. Second trend…. Proposals to overhaul transportation agencies are emerging from New York’s civic groups. Since this will have more of a lasting impact than the Trump catalyst, the chapter will spend considerable space analyzing proposals. Here is some context for why a bold strategy for metros to rebalance authority may have an opening. Four years ago when posting my Penn Station piece in Aaron Renn’s “The Urbanophile,” my series had concluded that proper updating of central stations required reforming transit agencies. But, I was on the fringe. Later that year, the Eno Center (transportation’s established trainer and think tank) collaborated with the upstart Transit Center to publish “Getting To The Route Of It.” Subtitled “The Role of Governance In Regional Transit, ” the study analyzed six of the largest U.S. metros; looking hardest at New York, but the study also was critical of my metropolis, Chicagoland. That study changed the discussion so today’s crisis can be productive. Over the last three years, the damage to the Tunnels became more widely known. Precipitous decline — including New York’s 2017 transit summer in hell — pushed the civic establishment into calling for agency overhaul. But, New York civic leaders need time to work through proposals with the political powers-that-be. Do they have time? Nor will foresight grace decisions made during an emergency triggered by closing one tunnel for repairs. New York’s Vision is epoch-making again, at least by U.S. standards. New York’s civic leaders know they must overhaul agencies and this shows best in the RPA’s “4th Regional Plan.” Its wholistic approach to urban challenges focuses on reinvesting in its key asset, transit. For that, the “ 4th Plan” proposes four institutional changes for transportation: convert the Port Authority into an investment bank; rationalize road tolls; combine the three commuter rails into a regional network, called T-Rex; and form a public benefit corporation to update subways economically. Supporting this “4th Plan,” RPA just published an 86-page booklet detailing its T-Rex proposal (cover is above). It is comprehensive and candid. Criticisms can be made of it. (Let’s understate the antagonism and say that New Yorkers, justifiably, have famously profound relationships with transit… but I found this series of articles by Alon Levy to inform best.) Through the early haze, we should recognize RPA is pioneering the technical work to make its metro’s trains competitive with other global centers. But, New York’s political reality must change before serious hope can be mustered that the T-Rex Plan actually will improve commuting. For that cause, it also helps to remind ourselves that other global centers achieve this by conveying sufficient authority to agencies. By that key standard, T-Rex’s politics look pre-historic… or at least pre-New Deal. Only one of the booklet’s 86 pages discusses funding and governance. While that page suggests contemporary techniques (value capture, 3Ps, user fees), these will have minimal application as long as authority is held by byzantine bureaucracies. The only positive to promote overhaul is the extraordinary cost of transit. States should be glad to give that cost and headaches to a true metropolitan authority. But despite this common sense, the bears still clutch their honey-pot. Who will pry it away? As for my current situational summary….. The states of New Jersey and New York no longer should be higher authorities; based on their poor performance and the need for future accountability to the region’s taxpayers. As powerful as New York’s civic movement is, only federal leverage for the Tunnels sets in motion the required overhaul of state-controlled agencies. History Lesson: Only two higher authorities can make a way out of no way. First, God must grace Manhattan with enough time to replace the Tunnels. Even if Providence (or luck) intervenes, this fact remains: Man’s agencies have created extraordinary and unnecessary risks… and they will do so again. Specifically, the East River tunnels are also at the end of their lives. And so is most infrastructure surrounding Manhattan; making a moat of the nation’s central business district. The second higher authority is Uncle Sam. Constitutionally obligated to promote commerce between states, NY/NJ’s chances in Congress improve by stretching this assistance to all metros. Emergency action for the Gateway starts setting the legal frame for regional transportation by applying the prototype appropriately along the NEC’s metros and extending that to solve the Midwest’s multi-state mess around Chicago. If Plan A was the 2015 Obama Administration hand-shake that was so vulnerable to sabotage, Plan B declares the Hudson crossing a vital piece of national infrastructure for the NEC and the nation’s commercial center. To protect both, an Emergency Task Force (ETF) using federal authority manages the crossing’s update. This ETF also is charged with prototyping modern regional rail by tying together these three goals outlined here and detailed in the fuller study. 2. Take the next step. Prevent a similar emergency across the East River by structuring investments that maximize capacity of a through-network. So the ETF’s job is to help organize a tri-state transportation agency whose Board has clean elections. The Board has routine accountability for taxes and user fees. 3. Utilize private sector partnerships to get the most value for passengers and taxpayers alike. Transportation’s New Deal: Legal and political arguments sketched and stretched. Let’s paint a Big Picture: we are in the process of shaping a new order for transit. Cited by me early in the Introduction as a framework for this website’s strategy, the premise of “The Metropolitan Revolution” is upheld in case studies of “The New Localism.” (Brookings Institution Press released both books three years apart and both share Bruce Katz as co-author.) This sequel looks closer at how we transfer power from states and the feds to localities and metros. The book implies a corollary realignment in which we redefine each level’s role and, thus, smooth-out difficult transfers. “The New Localism” acknowledges that transportation infrastructure is a laggard in the realignment already taking place in other public services. To evolve transportation into the new order, ARC and the Gateway are central to understanding the new federal role. ARC mostly was three regional agencies hoping to solve problems. With federal power as a bit player, the ARC could not withstand its 2010 capital crisis. Learning there must be a higher authority to make it through a crisis, the feds led the Gateway. Despite Trump’s sabotage, Amtrak is the funding channel that keeps the Gateway alive. But to prevent the catastrophe of one tunnel closing, the federal role gets redefined further with a takeover of the Tunnel (again, justified as infrastructure of national importance) and includes the entire Gateway project. To prevent future calamities, the federal task force then assists in forming a representative metropolitan government. The theory of a metro/local revolution sounds like it might work for transportation except for this: New York and every metro must contend with this historic joke, “all you have to do is get an Act Of Congress.” This has been a bad joke for probably all of this Century. But fortunately for metro transportation, the joke has been replaced by the reality of today’s crunch time. When tunnel-failure is in the hands of God, Man’s misplaced authority has reached its tipping point. The game-changing conclusion is that states should not restrict metros from governing their transportation. An authority realignment strategy is equally simple: instead of letting Congress retreat from funding responsibilities, it first must agree to re-allign metro transportation so it can be more self-sufficient. We should expect lawmakers to start as early as 2019…no matter who is in the White House… or how un-civil Washington has become. With a recent record that invites intervention, the Port Authority of New York and New Jersey is an interstate compact authorized by a federal Charter in 1921. The PA coordinates the Gateway Development Corporation responsible for the Tunnels, Penn Station and infrastructure along an eleven mile route. Congress should revoke this part of the PA’s Charter, setup an Emergency Task Force (ETF) and also remake laws so the ETF can innovate public-private partnerships and apply those efficiencies. Specifically, let’s also test how the ETF can avoid unnecessary red-tape and stabilize funding to complete the project before a tunnel has to be closed. Regardless …… Lawmaking is the lever. Let’s think of this as a formula explored in the forthcoming chapter: Congress’ deal is it provides less capital, but metros get more clout. Despite the imminent Hudson emergency, we must prepare for challenges. Legal challenges, of course, can be preempted partially by effective political arguments. The primary popular lever is “no taxation without representation.” Taxes are essential to any ambitious re-build of infrastructure. The key factor in Denver’s impressive build-out is its transit district has an elected board. Revisit the end of my preview on how mid-sized metros changed and adapt that success to New York’s tri-state metro. A modernization managed by an elected Board whose campaigns are non-partisan and actually discuss clearly how tax dollars are invested. Ask the taxpayers who have to fund the deferred costs of bringing our systems to a “state of good repair.” That starts a good Deal. The second political level argues taxpayers at all levels must receive value. Since the federal government is already lending most the money for the two states’ contribution to the new tunnels, then Congress also needs to protect federal taxpayers so they get their money back. And the best way to insure that Uncle Sam gets his money back is to encourage a metropolitan government that can adjust taxes and user fees much more effectively than states can whose priorities are to feed existing programs. Setting up a metropolitan government with powers to deliver economically should be the corollary to the U.S. lending more money. The protecting-the-taxpayer lever is supported by news stories of runaway costs, probably the easiest-understood need for agency overhaul. Yet, a federal ETF also needs to reinvent how to maximize return to taxpayers and private partners. While the RPA’s “4th Plan” proposes solutions, U.S. criteria for financing is more likely to persuade states to realign power. Both political levers make it possible for emergency powers to plan a through-network that is turned over to a new metropolitan body. But the stretch is necessary since the NEC uses the same pieces of infrastructure as commuter trains. For example, my literature review analyzing the Gateway’s Moynihan Station concludes most independent observers do not think this is a good use of taxes. Moynihan/Penn remains a terminal when a through-station is the best investment to expand capacity. So, new federal lending standards must establish metro governance that modernizes outdated terminals. To stretch from emergency to sustained progress, Congress must empower a metro’s public to hold new agencies accountable. Consider overhauling Metropolitan Planning Organizations, creatures of the feds intended to spend taxes effectively within a regional plan. New York’s tri-state MPO collapsed in 1982 and the U.S. made scant effort to enforce its intent. Now, it can. Other enabling legislation could be considered within Amtrak reform (Amtrak owns the Tunnels and Penn Station.) While today’s bitter debates reduce our chances of effective solutions, let’s hold up the model of the German national railroad as the enabler of regional rail modernization. The policy entry point to seize control of the Gateway and get it rebuilt is still unclear. Yet intent is clear: the U.S. simply cannot reduce its capital funding and leave regions powerless to raise cash. The new deal’s policy principle is that U.S. empowers regions to solve their problems. Other policy threads can be woven to broaden this deal’s coalition. Trains are underutilized to stimulate redevelopment equitably (a section in RPA’s “4th Plan”.) Regional authority can use trains to correct disparities between Manhattan and the former industrial and underutilized lands of Brooklyn, Queens and New Jersey. Trains tie these disparities into a whole in the T-Rex (map below.) Follow its new through-route tunnel from Brooklyn’s Atlantic Terminal through Wall Street and Mid-town and on to still-struggling Newark. Trains connecting Wall Street to poor neighborhoods is a metaphor and tool for those who want to highlight equitable redevelopment as part of the metropolitan new deal. If the Tunnels crisis uses federal authority to help civic leaders remake their legal and political framework in New York, then other American metros have a better chance to find their particular path to reorder power and modernize into regional rail. While RPA’s proposals are getting to the root, they have not really asked states to share more power with the metro. To a large degree, that is Uncle Sam’s job. In reducing the reign of ineffective state bureaucracies, the U.S. also can mitigate how states failed to resolve city-suburb tensions. Captive to suburbs, state rail agencies did not modernize. Totaled up, U.S. intervention is the force that stimulates rebalancing transportation’s formula for taxation, representation, accountability and, finally, modernization. On a percentage basis (and playfully to shift to rivalries), NYC has over twice as many passengers as my city, The Second City. While still backward by European standards, Chicago recently updated its “L” (heavy rail) at a rate far faster than far-richer New York. And Chicago did this despite Illinois being broke, endlessly corrupted and even having a constitutional bias against Chicago. On a relative basis as the globe’s center, Manhattan has few true excuses for how its agency neglect brought transit so far below the standard of global cities. On the other hand, Chicagoland has better excuses: having the one broken state of Illinois has caused more rail deterioration than trying to coordinate three states. Minimizing Illinois control is the key element in the preview of Chicago Union Station (CUS); due to be posted in late June. Below is CUS’ Quiz question. (The Quiz is the most entertaining part of this site.) Take the Quiz and click on any fantasy rendering to read the Answers, short write-ups for why each central station is restricted by its states, including Manhattan’s Penn. 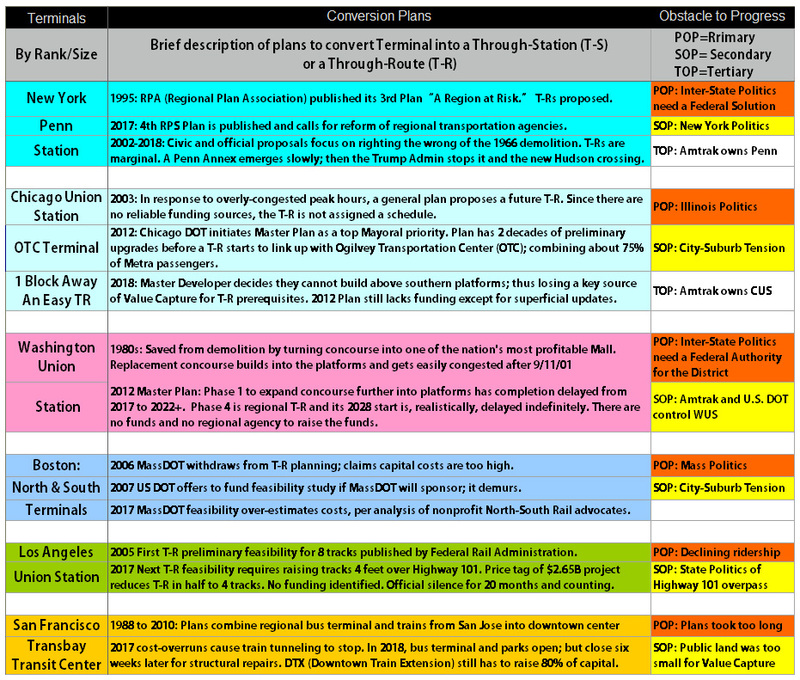 Author whatstationsteach.orgPosted on May 31, 2018 June 21, 2018 Categories Chicagoland, federal transit policy, New York metro4 Comments on Preview F: Penn Station And The Hudson Tunnels….. Are We Ready To Start Testing The 21st Century Standard For Regional Rail ? Rendering courtesy of Akridge Development, owner of air rights over the 1909 platforms. The green roofs compose DC’s proposed mini-city, Burnham Place. As fantastic as it looks, it cannot be built. First, the platforms below must be updated. But, there is no funding nor the political will to update to a global standard, despite the Capitol sitting one block away. Washington DC, Baltimore and Boston have central stations that need a simple tunnel before trains can benefit each metro’s commuters as they should. While each metro talks about such a tunnel, none can dig one. Intuitively, we know why. Our trains and terminals operate much as when they entered bankruptcy in mid-century: under-invested, restrictive agencies, uneconomic transportation policies that support autos at the expense of developing alternatives for commuters. After a quick analysis of how authority is in the wrong hands and often takes the wrong steps, this Preview proposes rearranging how we govern commuter trains so they stimulate growth around each central station and their network’s secondary stations so communities reap the benefits of transit more. In the Big Picture solution, elected officials (and the people they appoint to transit agencies) might complete tunnels if they were held accountable to achieve a through-routed standard similar, let’s say, to that which benefits Europe. To create this needed discipline, this Preview of three chapters outlines a metropolitan body specialized to solve each region’s transportation problems; judiciously borrowing some tools from their partner, Uncle Sam. Why is a metro authority necessary? The general answer is metro transportation rarely gets rationalized well by states; unless they are delegating that authority. (The previous Preview on California outlines the best progress.) In this century, the feds and some states are funding smaller shares of projects. We have just seen this trend’s big jump with Trump’s intent to make states fund shares they cannot afford. Clearer now than in 2017, authority must be rearranged if trains are even to keep the passengers they have. Real growth is unlikely. The metropolis is the rational place for rearranged transportation authority if we expect trains to serve the public better and give an edge to economic growth. Outlined in this Preview, these three metros represent Uncle Sam’s best opportunity to help trains stimulate alternatives to auto commuting. Symbols matter. For many reasons, the place to test and expand a metro regime is DC’s Union Station. (Hence, the station of the future is referred to as DCUS and the chapter will explain the strategy behind the abbreviation.) Instead of terminating two differing state systems as now, DCUS will center a redesigned network that serves one metro… much as the DC beltway was designed to rationalize vehicle traffic. Making the most of train assets also is pivotal to rationalizing the region and, indeed, making the Beltway work better. But in today’s real world, the leverage of a productive asset won’t evolve because the station is broke. Despite having one of America’s most successful malls, Washington Union Station lacks funds for updates and, pitifully, stands hat-in-hand on the doorstep of an indifferent Congress and, now, a capricious Executive. Congress is so negligent in delegating authority that the station’s concourse has devolved into a chronic peak hour congestion. More pressing for the region’s inner network, Metro is one of the nation’s most-stressed heavy rail systems. Expanding train service helps prevent Metro’s precipitous recent decline from recurring. Frequent through-service is a proven strategy to relieve the subways of Europe’s capitals, first Paris then Berlin and, recently, London. But, help from trains has two obstacles. First, plans for a new concourse and platforms are un-funded. Second, the need to rebuild them first prevents the fantastic mini-city (rendered above) from being built and providing revenue via value capture. Discussed in the DC chapter, stewards of public dollars also should update and expand the through-tracks to Virginia. A new through-route invests in a triple benefit of reducing concourse congestion, Metro stress and the region’s peak road traffic. Plus, it bolsters Homeland Security. Through-routing is not discussed seriously by agencies comprising the station’s Board. For contrast, Paris achieved this innovation in the 1970s. Its trains grew into the region’s key alternative to the car, stimulated other options and focussed redevelopment around transit. Paris could do this because one body had authority. Berlin and London proved this again. It is a recipe for progress… and should be in the U.S. The DC proposal can be adapted along the NEC. Let’s see at the next major stop. Good States Struggle. To highlight how misaligned transit authority is, Maryland has one of the best DOTs. Yet, it cannot make a central station in downtown Baltimore. Contrary to common sense, Amtrak invested for three decades in rebuilding a station almost two miles from the heart of downtown. This also perpetuated the station’s approach; a tunnel opened in 1873 and the NEC’s second worst bottleneck. Both could be resolved with a central station downtown … if an agency was effective enough to dig a new tunnel through the downtown. Smart States Struggle. Even the state with the brightest people cannot link its two terminals. Three governors have advocated a tunnel between Boston’s North Station and South Station. Despite trains being the best mode to relieve cobbled-together urban transit groaning under peak hour stress, MassDOT still killed a tunnel proposal a decade ago that even the USDOT wanted to study. Overview Over. For the balance of this Part 1 (today) and all of Part 2 (tomorrow), I outline the case to rearrange authority so it works for these metros. To overcome chronic false starts in these three and other legacy cities, the federal government must partner with metropolitan agencies before they can modernize. A constitutional key is the federal authority to encourage inter-state commerce and apply it to multi-state metros. This power proves its legitimacy when it converts legacy terminals into through-networks which, in turn, stimulates commuting alternatives that generate more revenue and support regional redevelopment. The policy proposals for these three metros contained in their respective three chapters will be posted in the Fall 2018. So, comment please now on their outlines. Thanks. My 2014 photo above has a gauze-like image from scaffolds installed so masons could fix the dome’s cracks. Metaphorical to me, some cracks represent how Congress avoids policies that will help diverse metros develop their commuting alternatives. For example, serious cracks in transportation policy help explain why Union Station is broke. Contrasting to its 1990s success as an asset that stimulated one of urban America’s great renewal stories, Union Station never figured out how to finance its future. So despite its 2012 Master Plan being published with great hopes, it remains unfunded and congestion worsens. Making the Station’s problems permanent, Trump’s plan pushes even more responsibility on fiscally unstable states. Since neither Virginia nor Maryland will adopt Washington’s Union Station, America’s best chance for transportation progress is an orphan. For those wanting reliable funding that advances transportation policy by decentralizing authority, the time is now and the place is DC. Anyone hoping to lure the private sector into the hugely unprofitable business of moving commuters had better invent an authority to change entrenched commuting habits. For prospective private operators soon will learn they cannot succeed unless they work with an inventive agency that has the public’s support. Will the region’s taxpayers step-up ? Only if new agencies are based on a new deal. Consider DCUS (the through-station) as the nation’s prototype. First, let us briefly unravel how authority got misplaced. This chapter offers the cautionary tale from the 1980s deal that converted Union Station’s concourse into a hugely profitable mall. While saving the station from destruction, that deal shorted transit’s interest; given that mall deal set aside no money to update today’s inferior concourse. I also argue the station’s air rights were sold cheap; losing leverage to negotiate a win-win value capture scheme. Showing its sincerity, Trump’s proposal ignores the obvious solution to reconstruct governance so regions can solve these transportation problems that states have neglected for decades. A first experiment to craft regional transportation policies starts with the federal District. This “CityLab” article contains a good summary of DC’s gridlock caused by underinvestment in Metro, the region’s increasing population and congestion and the lack of a political body to act on these inter-related problems. The station’s aged caretaker (Amtrak) is no shape to redevelop tracks and platforms so DCUS can center a through-network. If a new agency can run through-tracks, the mini-city vision (rendered at the top of this Preview) can become reality. While Amtrak and the USDOT lack regional nuance, they still can channel federal authority to metros. For that, the DC chapter in “What Stations Teach” will propose a prototype. A Capitol Region Transportation Authority (CRTA) could update the platforms/concourse, help make the Burnham Place mini-city into a success and even make an electric through-route to Virginia. CRTA would be a symbol to the nation that these problems, typical of our larger commuter systems, can be solved by rearranging regional transportation so the metro’s citizens have the incentive to fund and change habits. Lost in America’s ideological civil war, we forget Uncle Sam’s purpose is to make sure everything works together to provide the best public service at the best value to taxpayers. Today, that includes new metropolitan agencies that can attract private capital. So that common metro mistakes can be best resolved (and most central stations fit that description), a federal rationale emerges to share solutions and adapt them to a region’s specific needs. That rationale gets expanded further in Baltimore where Amtrak’s 8th largest station is almost two miles from its downtown. Courtesy of WikiCommons, this photo looks north past Baltimore Penn Station; showing its isolation. As a clue to the problem, Amtrak is making its fourth attempt to convert two floors of Baltimore Penn Station (BPS) into a hotel. Three earlier attempts failed, partly, for the obvious obstacle that BPS is inconvenient to downtown. Nor will an agency correct Amtrak’s mistake made two decades ago when it abandoned downtown Camden Station and, instead, invested in the off-central BPS. If you think I overstate, consider a more balanced view of Penn’s positioning. Nothing can ever change that Penn Station sits two miles from downtown nor that Camden Station could be a superior transit hub; serving several large downtown office buildings, nearby Harborplace, several other tourist attractions, the Convention Center, many large hotels, two medical centers and two athletic stadiums… all of which bring tourist money into a city that desperately needs more. Yet, Amtrak persists to invest in BPS; despite only really serving two nearby educational institutions that do not attract much outside money. While pedestrians are often the largest source of passengers entering central stations, BPS is borderline hostile. It is wedged between its tracks and surface lot on the north while a highway divides it from its south. Compounding isolation, eastern and western streets are wide, one-way and fast-moving. Besides three educational and cultural institutions, the half-mile ped-shed to BPS mostly has residential neighborhoods, on average, struggling to stabilize. A true custodian of public assets — or a supervisor of private operators — should find money to tunnel so trains they serve downtown redevelopment. A pressing incentive to resolve this should be the 113 year-old tunnels that emerge on both sides of BPS. They constitute the NEC’s second worst bottleneck and are shared by freight and a commuter line, MARC. After two decades of studies, Amtrak’s preferred route for the new tunnel is within two blocks of the old. In earlier studies, a tunnel to downtown was suggested by consultants as an alternative. It was eliminated. Further illustrating Amtrak’s inability to make progress, a private proposal for a DC-Baltimore high-speed line connects to Camden Station; avoiding BPS as a non-direct route that does not serve downtown passengers. So Baltimore realistically could be included in the Capitol Region Transportation Authority (CRTA) which eventually also should include northern Virginia’s commuter line so that DCUS through-tracks create a unified network. Not only would this reduce Metro’s stress, but it would show America that multi-state dysfunction does not reign in the new metropolitan regime. A further adaptation based on the lessons of the CRTA can take place at the other end of the NEC in Boston where its talking for two decades has yet to produce a unifying tunnel. Despite being the city with the most innovative transportation alternatives in the nation’s most innovative state, San Francisco failed to tunnel train service downtown because, in the Big Picture, transit still suffers under laws that restrict it to second class. This failure should tell every big city mayor nationwide that grandiose gateway plans must be proposed within a campaign for new laws that aim to rebalance regional transportation. Station upgrades can happen if supported by a political logic that runs like this: trains stimulate alternative networks that redevelop communities around transit so road congestion is reduced and so those taxpayers who must save money… can. Related, SF’s failure results from over-reach. New central stations are too complex for mere powers of a municipality or joint powers board, no matter how competently they performed. Our transportation policy is rigged against SF’s Transbay Center having trains. Yet, it really is only a failure if we do not learn what no-trains-downtown teaches. The learning spreads. If trains get equal status under law, SF solutions can be adapted so plans for LA and San Jose stations also progress faster… but only if solutions use the force of California law. When pressed, California has devolved some transportation authority to metros. Accelerating that process is simpler than we think; if we use for regional advantage the state’s mid-term fiscal weakness. With demonstrated benefits, SF’s central station is the prototype to guide sub-centers down the Caltrain Corridor all the way to San Jose. That prototype gets accepted quicker if municipalities transcend their instinct to protect home rule from county and state-controlled regional agencies. And transcendence happens quicker if California makes governance of each metro’s transportation directly accountable to the property-owners and commuters who most benefit. Timid mayors cannot resist solutions. And California cannot stop the will of its three largest metros; all of whom have well-intentioned — and long-ignored — plans for evolving each’s regional transportation. Such a Big Picture strategy only works if each station’s precise analysis gives California good reason for letting go faster of its authority and devolving it intelligently to metros. To start that process, immediately below is the high concept for each chapter. And below that, each is followed by their respective preview of 762, 562 and 530 words. These three chapters have been drafted (two are quite long); but need editing and peer review. Hopefully, all comes together to be posted by Summer 2018. As America’s foremost mid-sized transit metropolis, San Francisco already uses some “WST” innovations proposed for start-ups such as The Twin Cities or Denver. While SF will benefit from more advanced doses of some innovations, the proposal for SF is more transformative. It is even more likely; because California is, optimistically, mid-way in decentralizing its transportation authority. A good strategy pushes this further. For background, the TTC is featured in the “WST” Quiz #6 and its 600 word Answer is at the end of this page. The Answer indicates how TTC problems and cost-overruns are ultimately an argument for the Bay Area gathering more authority to control its destiny. In addition to serving California’s metros, the Bay Area lesson equally important can be adapted to Philly and multi-metro states such as Texas and Florida. The SF central station’s first phase (a bus terminal just below the park rendered above) will be finished in early 2018. The second phase would have finished building Caltrain’s station two levels below ground at the end of a one mile tunnel from its 20th Century terminus. While renderings are impressive, the TTC’s finance innovation depended on VC schemes with nearby new-built towers. (One is the Salesforce Tower that just bought TTC’s naming rights.) Far more impressive, the towers constitute a second downtown. Reflect on how this has not been accomplished since Grand Central Terminal’s mini-city was completed in Mid-town Manhattan almost nine decades ago. On the surface, this strikes me as the 21st Century’s greatest triumph of American TOD to date. But instead of GCT’s staying power in which real estate and trains feed one another, the TTC’s trains cannot show up. Saddled with huge cost-overruns of a multi-layered deal with inadequate authority and accountability, SF cannot bring trains downtown; despite this being a priority for over a decade. Without fulfilling the promise of trains, many VC deals are falling short. Agencies operating under California’s Joint Powers Act cannot raise enough public capital, nor a sufficient revenue stream. This makes private partners wary. In terms of progress, trains jumped the track. How do we get them back on track ? This chapter proposes a strong, sub-regional public authority to negotiate with and manage a private partner to figure how out a GCT-like dynamic today can finish the job. Re-organizing such an authority requires a state law that permits intense participation from landowners in SF, the suburban centers and all the way to San Jose. The above map designed by SPUR, the Bay Area’s chief civic planning group, gives insight into a working strategy. Note that two purple Caltrain commuter rail lines do not connect to the transit-rich downtown and the BART subway. Also note the lighter purple line has only ten stops, including San Jose Diridon. This is Caltrain’s Baby Bullet; express trains serving mostly TOD suburban stations. Currently, there is no governing structure to help get any of the 24 other stations to build the TOD to generate the Value Capture subsidy required to support express service. That is a key part of this political logic that needs to be worked through: those buildings that benefit the most from trains should pay their fair share. VC works this principle; albeit now flawed in its early stages. The TTC funding gap can be closed by a series of economic incentives flexibly supervised by this new authority whose legitimacy and advocacy comes from an elected Board that represents districts based on proximity to train stops; using taxes layered by radiating ped-sheds at agreed upon intervals. Try this high concept: Ped-Sheds Meet People Power. This strategy avoids major political obstacles probably still lingering from five decades ago when south suburban counties excluded themselves from the BART system. This made Caltrain necessary. But now at capacity and stumped, the only clear path comes when California creates a metropolitan authority suitable to the tasks of train tunneling, highway pricing and overall mobility Corridor-rationalization that reduces road congestion economically. Solving the TTC has two purposes. First, it proposes this prototype authority that also accelerates redeveloping centers in the Caltrain Corridor to pay for improved service. Instead of a sales tax increase that is hard to sell to narrow-minded folks, new funds come from increased ridership and VC schemes based on property value increases. Second, this prototype proposal tests new authorities that, if they work, can be adapted and subsumed into a more orderly MTC… or a more comprehensive successor. The proposal also sets up how to fathom the very fancy financing required for the second Transbay crossing. This the Bay Area must have operating in less than two decades. Currently, there is no chance of getting this necessity when one considers TTC’s tunnel is 80% shorter and cannot be completed despite being a priority since 2005. In a Big Picture analysis, the above Google Map shows improbable bones to create a successful TOD for two major reasons. First, downtown San Jose’s Diridon Station is hemmed by highways on two sides. This upsets a healthy urban fabric and explains how half of Diridon’s 1/4 mile ped-shed on three sides is under-utilized as surface parking. On the east, the highway separates the central station from the downtown; reducing chances of successfully extending it. West of the 1/4 mile shed, there is mostly single family homes. These characteristics of sprawl typically mitigate against a quick redevelopment into TOD. Second, two miles north of Diridon is another hem from an expressway and a bigger subsidized infrastructure, an international airport. Federal flight clearance regulations limit Diridon’s surrounding tax base to mid-rise buildings. This reduces land values of what could be a skyscraper extension of a second downtown. By analogy… SF boosters said the TTC was needed to enhance SF’s status as a global center. So, Diridon’s placement in the middle of sprawl’s long-term investments can weaken San Jose boosters’ contention that they are the Bay Area’s other global center. Negatives aside, there are at least three reasons to believe San Jose’s plans will produce fruit. One reason is Google intends to buy most the parking lots and build a campus. Thus also by analogy, many of SF’s headaches can be avoided as there were too many owners around the TTC to construct a simple, lasting VC deal. Second, Caltrain has the nation’s highest percentage of reverse commuting; thus increasing net revenue and the chances of greater all-day frequency becoming economic. Third, the Peninsula suburbs, the South Bay and San Jose all have terrible traffic. Most the Caltrain Corridor will benefit from regulations using economics to rebalance car use. However, these three favorable circumstances still may not make trains successful when the competition is as highly subsidized as are cars. The TTC also had favorable circumstances and its execution was competent; but, joint power boards lack authority. Unless an agency has the authority to resolve problems, they will restrict San Jose’s ambitions for the Diridon as the centerpiece of Google’s innovation campus. This chapter takes the outline proposed in Chapter 4 and details the deal to replace the current Joint Powers regime (based on counties) and base it, instead, on the lands from SF to San Jose who most benefit from the trains. California’s incentive to decentralize further is that it must: only an elected Caltrain Corridor Commission can construct deals that reduce car congestion in ways that do not make voters really mad at the Assembly. This chapter syncs the regional priority of trains entering the TTC with a regional deal for a transportation policy stretching to San Jose and using trains to redevelop in-between. This proposal is part of prototyping MTC into a comprehensive — fully elected —regional authority to shape a balanced transportation policy for cars and transit. Until Chapters 4 and 5 are released, please comment, make research suggestions and, above all, offer to critique pre-publication drafts. Thanks ! The Bay Area lessons can help the LA region; struggling to un-due its mid-century mistake of nearly killing transit and its current Century mistake of not un-doing the laws that treat the Car as if it always will be the American Dream. The lessons from urban SF to sprawling San Jose will serve as a blended prototype to be adapted to the diverse, gargantuan LA metropolis. 6) LA’s Transit Renaissance: Will It Be A Make-over ? Since posting my 2014 hopeful review of Los Angeles Union Station (LAUS) as the anchor of LA’s transit renaissance, my enthusiasm is dampened by how the car culture resists competition from alternative mobility. Resistance to change explains delays in updating LAUS, its cost-overuns and tactical mistakes. Plans to make most tracks run-through were cut by two-thirds due to huge cost increases. There also are setbacks in turning the isolated LAUS into a destination… particularly disappointing because the municipality of LA controls its land use… or should. Also reviewed in this chapter, commuter rail ridership has flat-lined while the region’s congestion worsens. Also confirming that people are still using their cars too much on shorter runs, five of eight of LA’s light rail lines have flat-lined relative to population growth. Yet in the Big Picture, LA needs a strategy to un-do its role in making The American Dream prioritize the car… if LA is serious about a balanced transportation policy. My quick review of LAUS is the #4 Quiz Answer. The Make-Over moniker is inevitable unless LA County figures out a new strategy to level the playing field with cars. My photo above is ARTIC, the Anaheim Regional Transportation Intermodal Center. Following in the ambitious planning footsteps of LAUS, ARTIC is southern California’s second great Edifice Complex. So dazzling is this station, that it took me a while to understand its fundamental flaws. ARTIC bears spiritual resemblance to Disneyland, one of its four major nearby attractions. Gorgeous as ARTIC looks, it is poorly designed; adding to the growing evidence that the political appointees approving all this new transit infrastructure are as timid to explore 21st Century solutions as their political masters. I surmise that they hope a fanciful building or a new light rail line will help sustainable transportation emerge. Instead, Americans need to know the inconvenient truth about the un-affordability of the auto and the large lot suburban home for middle class families. While professional politicians may shy from these emerging truths, their true job as leaders is to help build a new Dream for mobility. LAUS and ARTIC are the beginning metaphors to tell the new story of how sustainable transportation is more likely to emerge if cars are used less. At least, that is how my chapter treats them. And of course, better targeted public funds must be found. While California’s new legislation for EIFDs (Enhanced Infrastructure Finance Districts) still needs changes to make it easier to capture value, these three chapters’ primary goal is to explore how to make sure there is proper authority to spend the new tax money wisely as possible. Linking the TODs from San Francisco to San Jose can be a prototype so southern California’s Metrolink (service area above) connects TOD-enhanced downtowns from western-most San Bernardino through LAUS to Ventura and from Oceanside north through ARTIC to LAUS. Since Metrolink politically can’t do all that for those six diverse counties, at least a new authority for LA County starts the process of how trains help redevelop stations into multi-centers for mobility’s alternative order. Make half a dozen in LA County good enough. Then, other stations across the region cannot resist… or, at least, so goes the Hollywood script. Previewed in February 2018: How Federal Policy Can Help Commuting Within The NEC. In the previous six chapters, agencies view Uncle Sam as a checkbook and Amtrak as, let’s say, less helpful. The federal government — and certainly the national railroad — must be the partner who helps metropolitan agencies succeed in using the most effective technology to move people across a metropolis. And together, they must act together to give taxpayers value for their investment. Recent trends for performance-based federal investments must be accelerated to utilize better how trains reduce car congestion. The NEC also highlights how Uncle Sam’s updated use of the Constitution’s commerce clause should encourage economic growth within and between metros. These enhanced federal-metro powers should help trains get un-stuck from histories dominated now by poorly cooperating states. The focus for the remaining chapters is to propose solutions that convert legacy stations and systems into high capacity through-routes. Summary of 3 Sections. If a central station has improved its connectivity and capacity, it usually tracks back to the region improving its governance. Briefly, here is the story of three stations that improved because the metro sought to progress beyond the bankrupt lines they inherited. 1. While Philadelphia’s three Center City stations (the nation’s only through-route) resulted more from municipal moxie, the region’s transit agency (SEPTA) moved out of caretaker mode in the early-1980s, made a few changes and was key to one of America’s most successful downtown redevelopments for older cities. Today, the region’s sub-centers can benefit from this key infrastructure if it is reorganized. 2. One of the Twin Cities has a new central station; the other beautifully restored its station. Since the 1970s, the governor-appointed Metropolitan Council served as MPO and transit operator. But, it became distrusted. So voters created county-appointed Boards to invest a new sales tax to fund the transit build-out. That change seems to have run its course and regional reforms are needed to advance transit. Each story is detailed a bit in its respective mini-chapter below of 515, 496 and 712 words. In early 2018, each will have a lengthy article detailing further how the central station reflects the region’s governance and how each still can be improved. The author took this east-west photo of the Center City model at Philadelphia’s Center for Architecture. The foreground begins the through-tunnel running under the main street. The SEPTA bi-color “S” approximates underground Jefferson Station, then midway is Suburban (also an “S”), then across the river is the 30th Street Station. Completed in 1983, the Center City Commuter Connection (CCCC) is a mere 1/2 mile four-track tunnel that converted a 19th Century terminal into a through-station. This connected to Suburban Station and created the possibility of the nation’s first through-network; similar to those benefitting almost all major metros in Europe. Arising from Suburban’s underground platforms you can see the 1930s east-west track crossing the bridge to the monumental 30th Street Station that terminates Center City’s main street. Since it already is a dual direction through-station (made by Amtrak’s north-south NEC), 30th Street will become the nation’s most effective large hub after the planned update resolves its connectivity problems. For your background, the first article and scorecard of “The Urbanophile” series posted in September 2013 focusses on the CCCC. Since then, little has changed for trains. Then as now, SEPTA only uses its through-route at about half its potential peak capacity. Primarily used to bring suburbanites downtown, trains should instead be used to help build sub-regional centers and their TOD. For example, a very small percent of passengers use CCCC advantageously for non-Center City destinations. My take-away from this link is SEPTA — without power or funds to design a modern system — resigned itself to the pre-CCCC pattern of radial lines terminating downtown … as designed for the late 19th Century by the Reading and Pennsylvania railroads. SEPTA’s obstacles to 21st Century rail standards are many: inadequate regional authority, an unconcerned state, a train union that resists progress and chronic fiscal crises that have piled-up almost two decades of deferred maintenance. But, Philly offers us an important lesson. Symbolically, CCCC connects at City Hall and was made possible by Mayor Rizzo’s political will. Long-term mayoral focus paid off as CCCC played a key role in one of America’s most successful downtown revitalizations. But relative to Philly’s high poverty rates in many neighborhoods, the next focus of political will should help trains redevelop sub-centers. This chapter suggests how redeveloping 30th Street Station and its surrounds into an extension of Center City can lead to policies that transport people to other redeveloped sub-centers. More important, this chapter suggests how Center City needs Manhattan’s advantage of more easily levying higher bridge and tunnel fares to pay for maintenance. These and other car usage fees also increase train use and revenue. Probably posted in March 2018, this chapter concludes with the website’s theme: the authority SEPTA lacks is common to other multi-state major Metros on the Northeast Corridor. Before they can change commuting patterns significantly, NEC metros also will benefit if their states devolve parts of transportation authority. Uncle Sam must encourage this while also setting a federal standard for funding regional trains that makes through-networks. This is explored further in Preview D for Chapters 4, 5 and 6. The author’s photo of the light rail hub as a destination spot and Target Field. A minimal commuter rail station is on the other side of this light rail hub overpass. 2) Twin Cities: Counties Pick Low-Hanging Fruit, But What Grows Ridership? In two decades, Minneapolis budded into a transit metropolis. Key is the above hub that repurposed an old warehouse district and rebuilt it into a mixed use neighborhood, an entertainment district that includes Target Field (where the Twins play) and the multi-purpose indoor Target Center. Supporting all this is transit and car infrastructure. Continuing this display of nearly picture-perfect planning, a revitalized downtown is two stops away via light rail. So with sufficient evidence, The Metropolitan Council, the seven county planner and transit operator, boasts that the transit build-out has attracted private investment for TODs around the Target complex, in both downtowns and, increasingly, at other light rail stations. Their transit network grew mostly after a new deal with taxpayers. Distrust with the governor-appointed Metro Council resulted in five counties forming the County Transit Improvement Board (CTIB) whose job was to invest a 2008 sales tax for transit. Recently, CTIB dissolved as a Joint Powers Board. Two counties composed by the Twin Cities and inner suburbs are moving forward with fewer restraints. They have increased their sales tax to continue the build-out. With CTIB’s other three counties in a muddle, events support the “WST” theme that county-based agencies do not satisfy taxpayers that live further from transit and that property-based revenue helps strike a better deal. This chapter argues that while the Twin Cities competently laid track, current agencies cannot deliver an economic alternative to the car. Often suffering dysfunction caused by an otherwise rural state running more interference than is healthy, the Twin Cities are at a pivot point about how restructuring governance can take transit to the next level. Such ideas are further developed in the chapters covering the innovations being tested in Denver and the Bay Area. Photo courtesy of Denver Infill. Visit their blog entry to see how this nearly vacant train yard transformed from 4 years ago into the mini-city above. By the standards of mid-sized and large American cities, Denver’s transit transformation has no rivals… certainly for speed and completeness and likely regional complement by its growing Transit Oriented Development. Denver’s Regional Transportation District (RTD) has two strategic innovations: its elected Board and PPPs. Both help explain its rapid ascent as a transit metropolis that aspiring metros should consider. First, the RTD’s Public Private Partnerships worked as well as could be hoped for. They leveraged public money to attract sufficient private borrowings to restart the build-out. PPP efficiencies also sped-up the remake of Denver Union Station into a destination, its surroundings into a successful mixed use neighborhood and a dedicated line to the airport into a success that shines compared to the troubled efforts of far larger metros. Using public capital generated from a 2004 sales tax initiative (called FasTracks), the RTD started construction of its rail networks. But, huge cost-over-runs emerged. Worsened by reduced sales tax revenue from the 2008 recession, FasTracks faced stoppage and would lose credibility with taxpayers. So with elections holding representatives accountable, RTD structured PPPs to resume the build-out. An added public benefit was private partners held to budgets noticeably better than the RTD had when it managed construction. Denver is widely regarded as turning its derelict station into a model transportation hub. Capping this consensus in 2015, Denver Union Station (DUS) received the prestigious Global Award for Excellence from The Urban Land Institute. ULI’s Award noted how well DUS, RTD and resulting PPPs were converting 22 acres of rail-yards and an under-utilized warehouse district into a mixed-use extension of the downtown. While enthusiastic in its boosterism, Denver Infill’s website is worth a look to see how the central station’s surroundings and the metro’s sub-regional TOD are being stimulated. The “instant urbanity” encouraged by Denver’s trains make it the most likely (by far) to get the nod for Amazon’s 2nd HQ, so far the competition of this Century. During 2017, Denver’s four light rail lines were joined by DUS’ third commuter line. The looming 2008 failure has been turned into a network; all guided by RTD’s elected Board. While it is too soon to tell if enough metro taxpayers will get out of their cars and take advantage of transit by becoming regular passengers, this chapter speculates that RTD’s next strategic innovation is to advocate for complete transportation policies. On the finance side, it also is too soon to tell if the RTD’s performance is good enough to change the bond market’s lack of trust in tax increment and Value Capture deals. While still needing to test transit’s help to moderate future real estate slow-downs, Denver is, for now, a boom-town once again. But if the RTD can lead Denver through the 2008 real estate depression, it probably has the metro-moxie to work through future recessions. I add this question because some of Denver’s success defies logical explanation. If electing a transit Board actually turns them into risk-takers and problem-solvers, why do legislative elections continue to produce such terrible results nationwide? Part of the answer is Colorado is known as a “good government” state that delivers results. For the metro’s RTD, voters apparently elected clean politicians who used campaigns to discuss transportation issues instead of legislators using campaigns as opportunities for wanton character assassination. Carrying problem-solving into office, RTD’s Board “thought outside the box” to deliver an alternative network. As agencies nationwide fumble to develop alternative delivery methods and PPPs, the RTD’s unprecedented performance lends credence to the emerging maxim: “when private capital is involved, better decisions are made with public funds.” To extend that maxim, other states should establish metro agencies with clean elections that reinforce a new deal with taxpayers and deliver 21st Century networks. Preview For Multi-Metros. Besides being Colorado’s economic engine, Denver also is its Capitol. Thus, the RTD’s authority to innovate could be monitored closely. But, multi-metro states have a different dynamic and need a different model for devolving state authority. For that, we next analyze how metropolitan transit is evolving in California. Because major stations are struggling for their new life in the Bay Area and LA regions, Preview D looks at how California can devolve authority faster… with possible applications in more multi-metro states such as Pennsylvania, Texas and Florida.